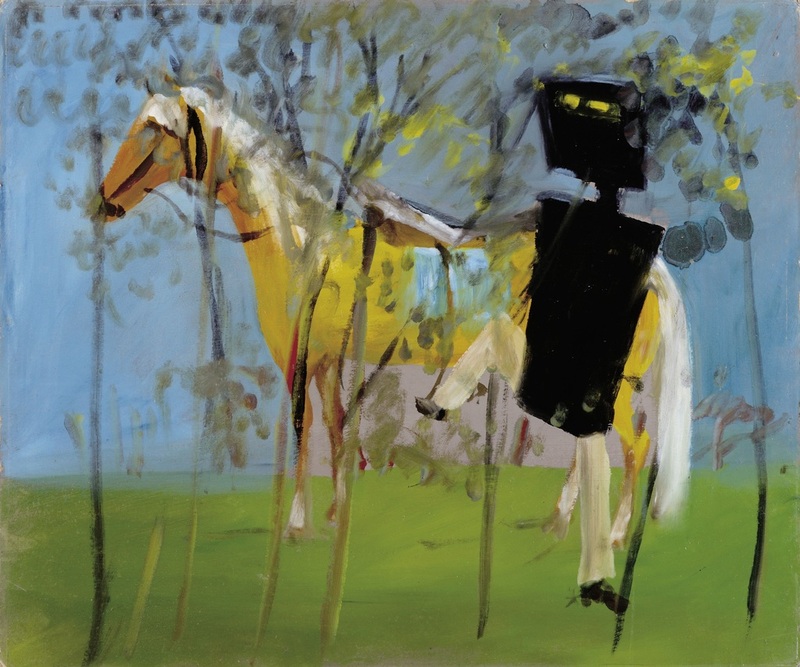 Nolan created several works depicting Ned Kelly on his horse, all of them different. In the Foundation Collection, there are two paintings created a year apart that share the same title. In the earlier painting, created in 1945, Kelly appears behind a shroud of saplings, and notably his back is to the viewer. There is a sense of comic absurdity as we see the bushranger, weighed down by his home-made armour, struggling to gain a foothold to mount his horse which patiently stands by. In the 1946 version of this work, Kelly is significantly more confident. He is shown astride his horse with his gun poised as he fearlessly stares at the viewer. In contrast to the earlier work, here Kelly and the horse have been thrust into the central foreground. Stylistically both the forms and rendering of the landscape are bolder and more hard-edged compared to the earlier work. This painting emphasizes the symbiotic relationship between Kelly, his horse, and the Australian landscape which is reflected through the cut-out eyes of the horse and the aperture in Kelly’s black helmet.